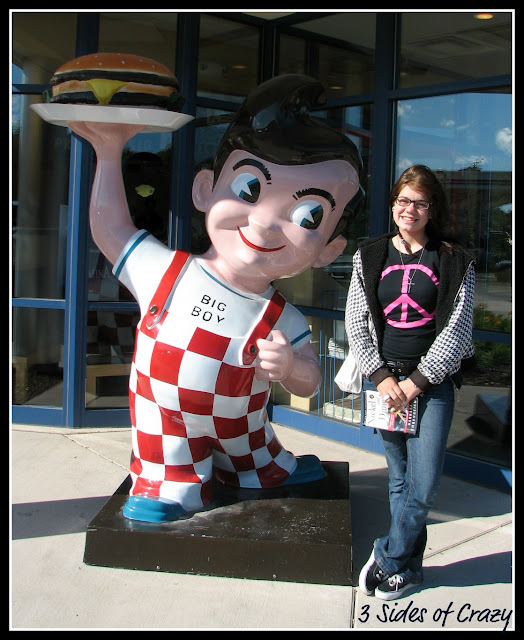 Savory Kitchen Table: 3 Hour Tour - Lake Superior, Pictured Rocks and AMBER'S first BIG BOY! 3 Hour Tour - Lake Superior, Pictured Rocks and AMBER'S first BIG BOY! We set off on a 3 hour tour only to find that Am didn't know about Gilligan's Island, so our lame jokes about the S.S. Minnow were lost on her. We decided to take a glass bottom boat tour of Shipwrecks, but at the last minute had to change to the Pictured Rocks cruise because of timing. This is Indian Head point and this arch used to have room for a small boat to travel under it until it's collapse a decade or so ago. Notice the tree growing on top of that pile of rocks. If you look closely, you'll see the roots actually drape across to the land! Obviously the wind blew a bit today, but we had fun and finished the day with hot fudge sundaes at Bob's Big Boy.